Sometimes I like to think about what Hold, Hall and Weyr would be like 500 years after the ninth Pass. In 500 years would the technology found at Landing still function? It's fine to believe all the computers survived in storage for 2,500 turns, but when things start getting used, they wear out eventually. If I recall that's what happened at Fort during the first Pass. Pern is mineral poor, so I can't see an electronics industry growing out of the Smithcraft Hall. So I think the tech level of the Pernese would settle down at a level around the European Renaissance. They would have printing via movable type, plus wood cuts for illustrations. Knowledge would not get lost and books could be reprinted. Would anyone think to print out ancient history before the computer and printer failed? One hopes so. Firelizards would serve a the quick message system and the Weyrs could be employed as fast transport. My private concern would be that the dragons, no longer sensing the incursions of thread, would eventually die out from attrition and lack of enthusiastic mating flights. Would the Pernese eventually damage their ecology from over farming the land due to overpopulation? I think the mineral poor aspect of Pern tends to get exaggerated in the fandom. It's an Earth-like planet in the back of beyond, so far out from civilization that a few thousand back-to-the-landers were able to buy it for a song. It doesn't have to be mineral poor to get categorized as "resources negligible." It just has to not have anything worth shipping a mining operation on a 30 year round trip to get. If you have the technology to mine in space, if you can disassemble asteroids that are basically kilometers-long chunks of useful ores, if you can skim the atmospheres of gas giants that might have exotic elements hiding in them, there's not much on an Earthlike planet that's worth the effort. You can get more and cheaper elsewhere, and without ruining any nice real estate. So Pern probably has as much going for it as our own Earth does, resource-wise. It might be short on fossil fuels, depending on whether or not Thread eats those. So Pern's tech level is going to depend largely on how good an industrial infrastructure they manage to build with the plans AIVAS left, and how interested the people in power continue to be in developing that infrastructure once the current generation of visionary leaders dies out. I could see this being developed over a period of time with them starting out with small chunk Asteroids until they perfected the technique to move objects as large and as massive as the engines of the three Colony Ships. The dragons can also be used as flying ambulances. I hadn't considered the idea of asteroid captures by dragons. There's a company now that is thinking along those lines. The asteroid would be brought back and put into orbit around the moon. It's been said the dragons can provide many of the services for which we rely on aircraft. Bulk haulage could still be accomplished via ships and wagons. There was even mention in Dragonquest that Fandarel put wheels on the barges to facilitate haulage of the materials he needed. I've often wondered that they didn't scavenge all the materials possible from the two colony ships before getting rid of them. They removed and brought down to Pern pretty much everything they had a use for on the surface, from wall-panels to bunk-beds. By the time Sallah went up with a team to collect final recorded materials and do some monitoring of the surface, it was quite hazardous to walk around. Structural components had to be left, and the fuel, and the computer system that provided Pern-wide communications with AIVAS. They may have planned to go back for more later, but figured they had plenty of time, and everyone wanted to get on with claiming their stake-holds or prospecting for metals and other resources. Pern had adequate resources. The limiting factor on development was the potential for damage to the environment. The original settlers had seen the worst results of industrialism, and there was probably something written into the Charter about what processes could or should not be used. I'm surprised they went back to using coal, but after a few Passes the options were severely limited. The idealism of the original colonists probably had about as much relevance to the Pernese a few Passes down the line as an upper middle class vegan's opinion on eating meat does to a kid in Somalia, to tell the truth. They're in two entirely different contexts. The Pernese don't know the problems that come with industrialization, because they've never dealt with them. AIVAS probably left them some warnings, but it's human nature to see the opportunity for wealth and not the price you'll pay for it. Pern is the same as Earth and has the same resources. Study planetary formation all the heavy elements stay in the inner solar system. So I would say that Pern has just as many resources as Earth. As to what will happen 500 years in the future Pern will settle into a mid to late 20th century technology with out the use of petroleum. Avais left them with the Knowledge to create the necessary computer and communication technology. Dragons will still be around as transport and delivery systems that the original sleds played. Think about any modern city on earth without the use of internal combustion engines. You don't get exactly our society and cities without the internal combustion engine (and extremely sophisticated power generation and distribution systems. A few windmills and solar panels don't magically generate enough power to have a modern first-world city and they DEFINITELY don't magically beam energy, no matter what the Tesla fans claim.) Pern isn't likely to develop the industrial capacity to have the equivalent of American/First World technology because they don't necessarily have the resources (though if they were so inclined, they have petroleum) but they also don't have all the same impulses. They're a small population with, for now anyway, one fairly monolithic culture, language, and beliefs/lack thereof. Peaceful monolithic cultures do not generally create major technological advantages. Pressure causes change and fuels technological development. Pern doesn't even have transportation pressure-they have telekinetic, teleporting dragons who (skywatching nonsense aside) are going to need jobs to justify their being an artificially-constructed strain on the ecosystem. The computer stuff is ridiculous. You can't keep repairing them forever (see DE/RSR), the parts will not last eternally, and even if they figure out early industrial levels, its not likely they're going to come up with the technological level required to build computer components. With Thread now gone and Weyrs opening up in the South and West Continents with more room to grow/farm food, do you think the Southern Weyrs will now tithe to the Northern ones to replace the Hold tithes? Or will the Northern Weyrs just be abandoned again? That's pretty much the way was thinking. Electronics, or at least integrated circuit electronics just aren't going to be sustainable. Once you get into the Industrial Revolution, the pollution goes way up. This is not to say silicate based plastics couldn't supplant what we used a great deal of steel for. The Romans were fantastic engineers and you could add eco safe plastics to that and 'primitive' electronics (Fandarel had an electric intercom system in his CraftHall.) With hydroelectric power generation, electric motors are possible where animal power was either unsuitable or inconvenient. I'm thinking mining might benefit the most from electric lights, electric diggers, ore moving, but for the general, agrarian population, I'm thinking early 1800's America is about as far as things will go. It's would be an interesting admixture for fiction actually, Romanesque civilization with electricity and siliplas. Without Thread, though, they can concentrate on larger building projects--you CAN use wood and coal to created heated water and floors (the Romans managed) and they could begin to construct settlements in new areas--open places, they could use aqueduct systems to transfer potable water and use gravity feeds for household running water and flush privies instead of having to rely on ancient systems or natural springs (the Weyrs and oldest holds seem to have plumbing that runs on a combination of technology installed by the first few generations of colonists and natural volcanic springs. Without the pressure of a Pass, they don't have to focus on construction that withstands it or has to be done, and they can expand their agriculture without having to worry about what the Weyrs can protect. Heck, they can reforest areas and change topography. All with the bonus that firelizards and dragons eliminate a lot of pressure for developing long-range communication (probably why Fandarel's telegraph is a plot cul-de-sac that goes nowhere) and make land and sea transportation limitations much less of a problem, reducing the pressure to develop self-propelled transportation (it would still be reasonable to see other engine-driven machines, steam or internal combustion, for specialized purposes like agriculture. People who live in the very wealthy and comfortable first world can get emotionally irrational about using tractors and combines for farming mostly because they have the luxury not to produce food from animal and hand-driven equipment on anything other than a backyard scale. They were invented not because people are eeevil and want to destroy the world, they were invented because they make it easier to produce more food per acre and reduce the amount of manpower needed, and the risk of injury, exhaustion and death involved in manual labor. Having a steam engine to run your sawmill means you're no longer trapped having one only by a water source, ditto flour mills, or trapped only running it when you have sufficient wind. With the dragons, you now can easily move large pieces of equipment so no worries about building roads or only living near a navigable water source. Just to be clear, when I suggest the Pernese could have electricity, I'm not proposing they would have a continent-wide grid set up like us on Earth. It wasn't that long ago, even in the U.S. that power generation was a local town -wide phenomenon. The town I live in was a company town and had a coal-fired electric plant. Many had hydroelectric generators where appropriately falling water was available. But then, many of the towns around here were built near water for mills and such. That was part of the reason that F'lar wanted Dragonrider Land in Southern. It would allow the Dragonriders to have their own source of foodstuffs etc, thus taking the pressure off the Holds to Tithe now that they had eliminated the threat of Thread. Undoubtedly, the Dragonriders will be able to provide services to Holds that they themselves are not capable of, and with the end of the need for large numbers of Dragons to fight Thread, I can see their numbers being gradually reduced as time goes on, further reducing the amount of resources required to maintain a Weyr at Full Fall Strength. The major tithe item would have been livestock for the dragons to eat. Post-Thread, the dragons could hunt their own food, ranging over the entire South (giving herds in the local holds the miss, of course). Probably each dragon and rider would have a contract to provide services to a craft or major/minor hold, in return for the rider's living requirements. Tithing is going to wear out. Less dragons, and most of them won't be living in a designated weyr. they'll develop their own holdings and trade dragon services for goods as necessary. A large weyr where once 1000 (?) dragons lived will have plenty of room for stock and produce. How many dragons lived in each weyr at peak, anyway? I still stand by my statement that they would end up in a late 20 th century type of society. We are not that far from the late 20th century. People still had farms, they still road horses. I can see pern settling into a rural type of American society. Where there are towns with electric lights, telephones, computer terminals, with dragons supplying long distance taxis and the pernese come up with and electric type of personal transport. Steam powered or electric cars would not be out of the question. Why American? Given their feudal social structure they could land up with a Russian type one. Well I am not to familiar with Russian or even European rural life. I am familiar American rural life. We could easily say that pern is like modern rural Ireland. Since most of Pern was written from the Irish countryside: YES! Its called reading. 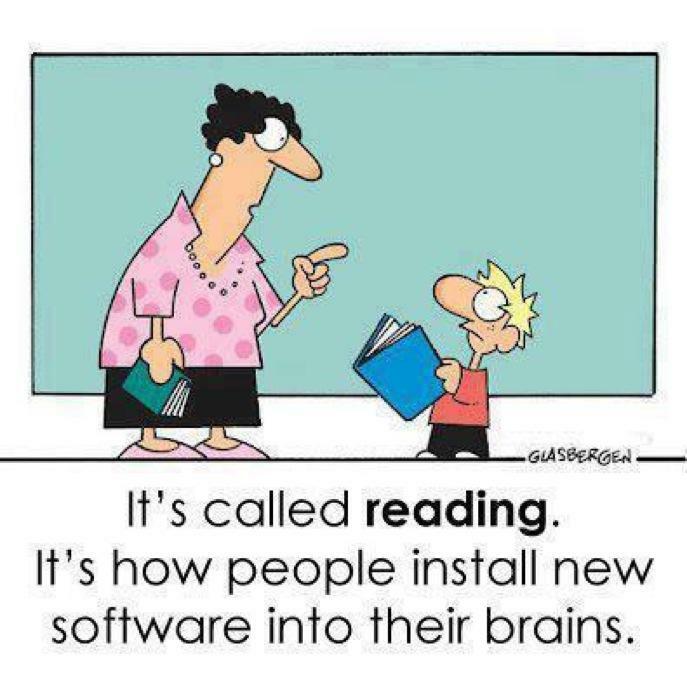 It's how people install new software into their brains.